The snow piled along Colchester's Malletts Bay last week made it hard to imagine that speedboats, sailing vessels and swimmers will soon ply the waterway. That's not all the warm weather will bring: Each summer, water tests turn up pollutants, including traces of human waste from failing private septic systems. Town Manager Aaron Frank cautions that "even a little" discharge "is too much." 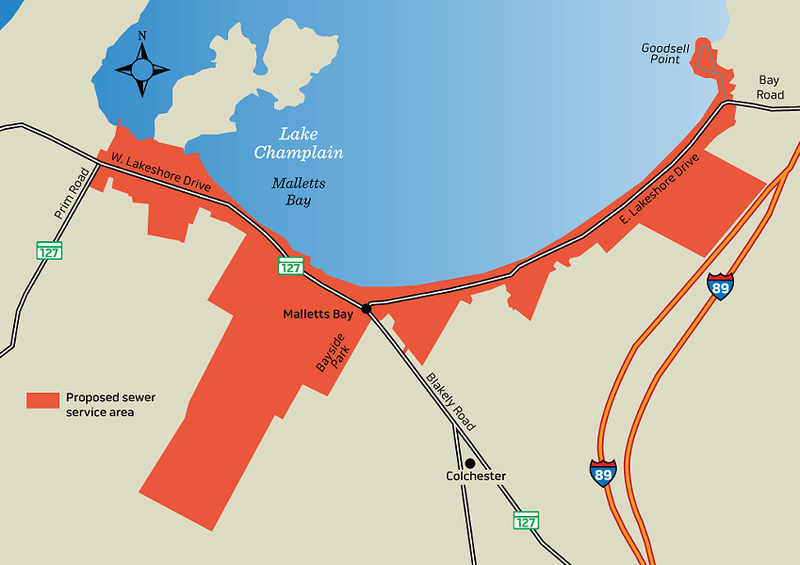 The proposed solution from town officials: a $14.3 million sewer line that would service 268 residential and 12 commercial properties along the crescent-shaped stretch of Lake Champlain shoreline. The project has the unanimous support of the Colchester Selectboard and approval from the Vermont Department of Environmental Conservation, which is offering grants and low-interest loans to fund it as part of a broader quest to improve lakewater quality. Most of Lake Champlain is safe for swimming and fishing, and municipalities still source public water from it. But pollution of various kinds, including phosphorous-laced stormwater from developed land and farms, has contributed to potentially toxic algae blooms and beach closings around the lake. Residents will have their say about the sewer line on Town Meeting Day, March 5. But already, some voters are urging officials to flush the proposal. Using a website and letters to local newspaper the Colchester Sun, a small but vocal group has banded together, dubbing itself the Friends of Malletts Bay. Members say the sewer line would waste taxpayer funds and barely dent the problem created by the many diffuse sources of pollution in the bay. Critics also worry that the sewer line would spur denser development along the bay. "It costs too much, and it won't solve the problem," said Jack Scully, a former Colchester Selectboard member, retired businessman and leader of the group. "If it did solve the problem, I'd be willing to spend whatever it would take." Colchester, population 17,287, is a sprawling rural and suburban town with abundant lakeshore. Its sewage infrastructure serves only 7 percent of the land in town. The 15-mile system is concentrated in commercial centers around Interstate 89's Exit 16, where Costco is located; and at Severance Corners, where routes 127 and 2 meet, and where zoning initiatives have stimulated construction of condos and apartments over the past decade. The sewer line would add about four miles to Colchester's network, including a new connector pipe along Blakely Road. The town's waste is treated at South Burlington's plant. The main section would run from where Prim Road meets West Lakeshore Drive, around the bay and its marinas to Bayside Park and the town beach, then past the densely packed homes and camps on East Lakeshore Drive. It would continue up the steep, narrow road to craggy Goodsell Point, where a cluster of seasonal and year-round homes are perched on a rocky promontory with stunning views of the lake. Pretty as the shimmering surface might look, what lies beneath has been a long-standing problem. Inadequate septic systems are not the only culprit. Stormwater runoff from roads and parking areas dirties the waters with traces of oil and gasoline. Tributaries carry phosphorous-laden manure runoff and woodland animal waste into the lake. Gulls and Canada geese contribute their share of droppings, and hundreds of boats — some with rudimentary on-board toilets — take to the waters all summer, coming and going from at least five marinas and a public boat access. Attempts to resolve water quality issues go back decades. 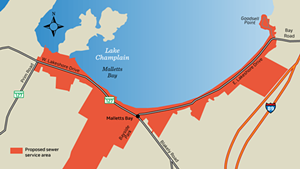 Twenty years ago, the town first proposed a sewer line for Malletts Bay. Voters defeated that measure almost 2 to 1. Some of those who were against it then are against it now. "It probably would promote a lot of growth," said retired nurse Marlene Booth, who has lived across from the bay on West Shore Drive since 1966. "I have a sewer system that's working, but they are going to make me join." Other critics echo those concerns. Phyllis Bryden, a registered nurse, spent $25,000 for her on-site septic system three years ago when she tore down a summer camp and built a new house on East Lakeshore Drive. She would be required to tie into the new line and pay monthly wastewater fees expected to average around $800 annually for residential users. Bryden thinks that's unfair, given the many sources of pollution in the bay. But she agrees that the water quality is poor. "It's terrible. It's garbage-laden. It's bacteria-laden. It's silty. It smells. [The pollution is] horrible, and it's coming from not just this area. It's coming from all around the lake," Bryden said. "It comes into Malletts Bay, and it sits here." The promise of glorious sunsets and moonlit waters has long attracted people to the scenic spot, even if they could only afford a tiny piece of it. Along East Lakeshore Drive, some of the houses are so close together that residents could hold hands out their windows if they tried. Front doors open directly onto the road, and back doors onto the rim of the lake. Last week, construction crews worked on new homes where old camps had been torn down and on major renovations to make seasonal properties into year-round ones. This trend, which has been underway for years, adds to the potential for more sewage to reach the bay because septic systems are used more often. While homeowners may have to upgrade their systems to get permits for a project, town officials believe even newer, pricey systems might not work effectively. A four-year federally funded study completed in 2013 found that many houses along the bay cannot support a proper septic system, new or old, because the lots are too small or sit on rock ledges, making it difficult to bury a tank. "This isn't an area that can be effectively served by on-site septic," Colchester Public Works Director Bryan Osborne said. "Given the lot sizes, money can't even solve the problem." Under local and state rules, existing septic rights are grandfathered in. Around Malletts Bay over the last decade, officials have documented at least 13 failed systems. They believe that waste from others is seeping into the lake. The 2013 study detected human waste bacteria in about 8.5 percent of the water samples from Malletts Bay beach areas. The sewer line is the best way to stanch the flow, officials say. "If we had some other option, we would have proposed it," Town Manager Frank said. Some residents do want the sewer line built. Plumber and innkeeper Neil Gardner co-owns Lakeshore Vermont, a three-unit property that would be connected. Many private homes and camps "have the squishy lawns by the lake," a sure sign their septic systems aren't working, according to Gardner. But some homeowners ignore the problem. "It's terrible," he said. "It's gotta be fixed." Renewed fears that the line would stimulate a wave of development are off base, town officials insist. Since the prior vote, the zoning for Malletts Bay has changed to conform to the small-scale development model that residents supported in community "visioning" sessions, according to Frank. The proposed sewer line is just one town initiative aimed at cleaning up the water. For example, Frank noted, Colchester is one of only a handful of Chittenden County municipalities with a local stormwater collection utility, which was created in 2017. Homeowners pay $52 a year on average for the town to improve culverts, pipes and drains to allow rain to filter into the ground rather than rush into the lake carrying debris and nutrients that cause algae blooms. But it's a big job. The town's Bayside Beach in Malletts Bay closed twice last summer due to high levels of E. coli bacteria, which may have come from stormwater and other sources. Funding is another sticking point for some residents. The 1999 sewer proposal called for a town-wide tax increase and would have required homeowners to pay to hook into the municipal sewer line. Under the current proposal, the town would pay to connect properties. Colchester would tap multiple funding sources but would not call directly for a property tax increase. It has secured a $3.5 million clean water grant from the Vermont Department of Environmental Conservation and hopes to qualify for an additional $1.5 million. Another $2.15 million would come from funds already collected by the town's 1 percent local options tax, which was created in 2015. On top of that, the town would use $250,000 annually from the options tax for the next 30 years to help pay off the estimated $8.6 million sewer construction loan. Some critics say that the use of options tax money represents a town-wide burden. They want that money to be used to lower the tax rate or for other projects. If the measure passes on Town Meeting Day, construction would start next year and be completed in 2021. If it fails, it likely goes down the drain, Osborne said. A defeat probably means Malletts Bay is "going to live with the conditions," he continued, "as dismal as they may be." The sewer line would run from the intersection of Prim Road and West Lakeshore Drive around Malletts Bay to East Lakeshore Drive and Goodsell Point. In addition, a connector line to Colchester's existing municipal sewer system would be built from Bayside Park to Severance Corners along Blakely Road.